Let's infuse visual magic into your passion project. just because your brain is a tornado of ideas doesn't mean your brand should reflect that! I'm here to give you the amazing visuals you’ve been dreaming of and FINALLY get this party started! It's rough trying to build a business on the millions of ideas rolling around in your head… You need a design expert to help you sell your dream to the world. Share your vision with me, a designer with almost 10 years of experience, and watch your unique brand materialize right before your eyes! Let’s bring your eclectic thoughts and daydreams together into one big beautiful brand! My unique Style Guide process provides you with a brand that deeply resonates with you and your intentions. Finally, you’ll be proud to share your passion with the world! Together, we’ll dive into exactly what you’re dreaming of and build a complete brand to bring it to life. 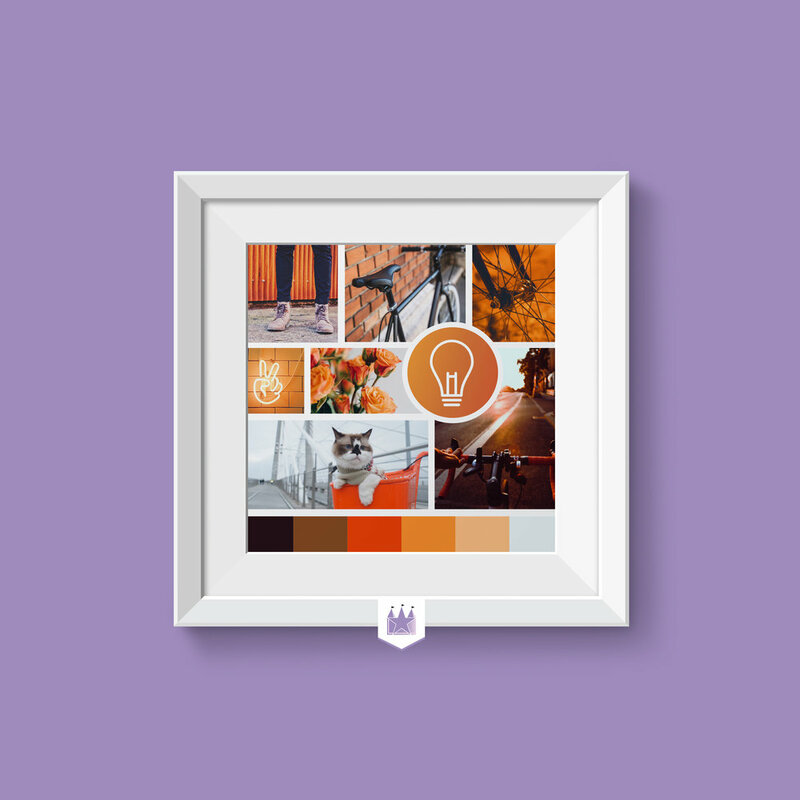 Our first step, your new moodboard, will lay the crystal clear foundation you need to easily keep your brand consistent and aligned with your goals & vision. Once we have your style nailed down, I development your complete brand style guide – providing you with everything you need to get your brand up & running in style! If you’re not quite ready to invest in full branding, you can start with the VIP Moodboard Creation Package, where we work together to discover, strategize and plan your look & feel before diving into the design. + As a VIP, you also get a 1-of-a-kind framed version of your new moodboard delivered in the mail! ✨ Use this unique art piece to help you manifest the brand of your dreams! High quality, framed art piece! Visualize & manifest your new brand! Uniquely decorate your work space! Prefer to take the leap?! After moodboard delivery, you can book a full Style Guide Design to match your new look! But, if you’re eager to get everything you need to start implementing your new brand, SAVE $125 by booking the full service right away! You have an idea of what you want your business to look & feel like, but have been struggling to successfully translate it to your audience. You need unique, beautifully branded assets to finally implement the business of your dreams and make an unforgettable impact! Includes Moodboard Creation Package + your totally custom Style Guide. You'll finish with all the beautifully branded assets you need to proudly premiere your new, strategic look in it's best light! You’ll be smoothly lead through each step of the design process so we arrive at a beautiful final product that you LOVE! + High quality, framed art piece! Need a full brand and website?! Bibbidi Bobbidi Boo. Don't worry — I got you.